[By Nick, limited time only] I told you guys I would be back to try Burger 21's latest offerings after trying the baklava shake and I'm a man of my word. Hey, I even took more pictures of the store as well. I'm on a roll already. Burger 21 hooked my girlfriend and I up with a gift card to make reviewing more of their menu easier. 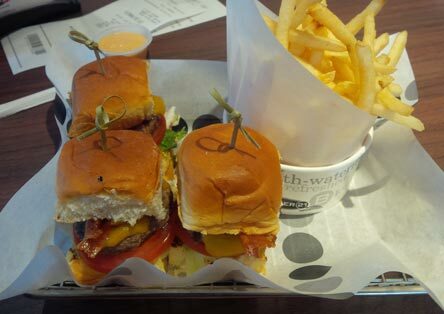 This time, we decided to go with the 3 pack of Bacon Cheesy Sliders and normal fries. The burgers were cooked to a perfect medium-rare which is a feat for such a tiny patty and the fries were much better this time around. I think we got as fresh of a batch as possible because they were hot but not mouth burningly so and had a nice crispness to them. 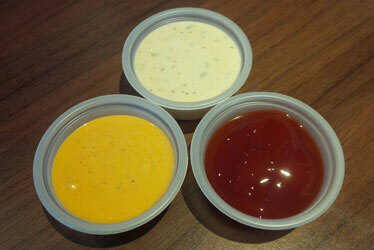 We decided to try out 3 sauces this time around: Ranch, Thai Ketchup and Ragin Cajun. Ranch is just ranch and I'm not a fan of it normally. The girlfriend approves so ‎if you like ranch, I guess it would be worth trying. The Thai Ketchup worked perfectly with the fries. Honestly, it tasted just like traditional ketchup with a kick but I'm pretty sure that's what they were going for. My favorite was the Ragin Cajun sauce but for the life of me I can't remember the description. It was more of a mustard base, with some creaminess and a handful of Cajun spices if my mind doesn't deceive me. This sauce was addictive for sure and was used the most by both of us throughout the meal. Once again, Burger 21 redefines fast food with their menu because it took them no longer than 6 minutes to complete our order. Now onto what you've all been waiting for. That sounds right up our alley here at On Second Scoop. Once again, the shake was rich, thick and one of the creamiest I have ever encountered. The chocolate sauce and graham crackers mixed into the milkshake itself make for an awesome flavor combo. You know those chocolate covered graham cookies you can get from Keebler? Yeah, this shake tastes exactly like them. The problem I'm getting with this shake being a S'mores shake is the marshmallow component. While they look pretty on the top of the shake, you don't get any sort of flavor in the shake itself. I like the fact that they're torched for presentation but when trying them on their own, they just taste like your typical marshmallow. Not exactly sure how that's possible but I'd love for them to incorporate some sort of marshmallow sauce into the milkshake itself. 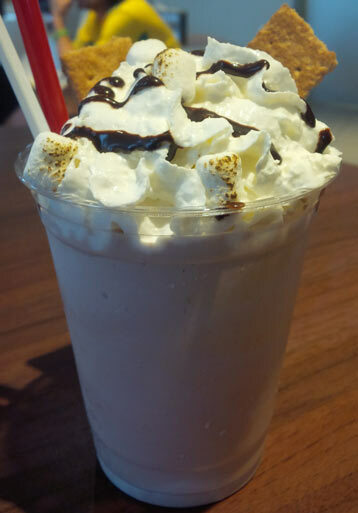 As is, it's a chocolate covered graham shakes visually accented with torched marshmallows. Don't get me wrong, it's a great tasting shake, it's just not a s'mores shake. 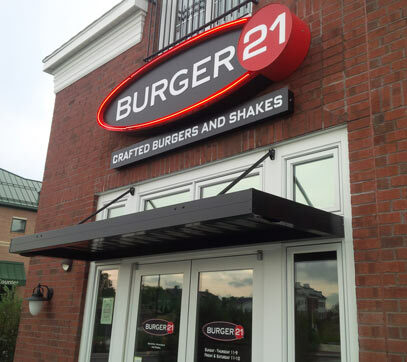 I wish the Burger 21 around me was good, but sadly the service is so horrible that I refuse to go - Regardless of how good their ice cream and shakes are. TTB, I've had nothing but great service the two time I've gone. It one of the best ran franchises I've ever seen for any ind of restaurant. I thought all of them would be similar to be honest. Nothing but great service the half dozen times we've been to this location. Love the Thai Ketchup on my fries. It's in the same vein as smashburger, but I'm finding it a cut above in most ways. (mileage may vary by location) Put simply, we're about equidistant from both and always go to Burger 21 (partially a local problem I think, as the Wolf Rd smashburger seems to have gone all salt, all the time). Serving the fries in a cup means they stay warm rather than tossing them loose in a basket like smashburger. The sauce selection is a nice touch. The monthly special burgers and shakes is nice, especially since they seem to put thought into them and do a good job. Nick, you should see about reviewing some shakes from smashburger for comparison. Plus, with BurgerFi coming in, they've got shakes, too...frozen custard based. @Dana: ha! thanks for the comparison! I've only been to smashburger once and the shake was great and the food was good but way too salty. Dana, I've been meaning to go to Smashburger especially since it's not even 5 minutes from my place. I know all about BurgerFi coming and I'm interested mainly because the Mazzone's will be running it with the Lia's.